Marketing is no longer based entirely on planned campaigns. The most effective strategies are now powered by real-time moments that require brands to be agile and creative on the spot. Social media has become a powerful driver behind increasingly important, but fleeting, moments that marketers are desperate to better understand. In the age of real-time marketing, brands are looking to respond to consumer actions with highly personalized content as quickly as possible, but the most successful tactics behind the concept is still unclear. There is currently little concerted research or industry data available to provide insight into the tactics, goals and strategies that power these real-time efforts. Even with guidelines on best practices and capabilities to put some of these efforts in place, many marketers have difficulty tying them to real return on investment. 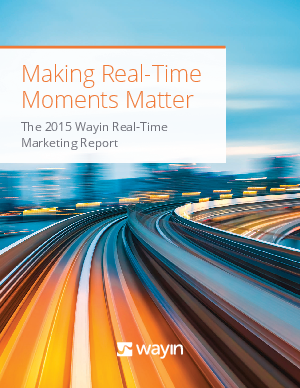 The 2015 Wayin Real-Time Marketing Report, a first-of-its-kind research study, aims to provide the marketing industry with a quantitative baseline for real-time marketing strategy, execution and trends as currently practiced by brands. The survey of 200 marketing professional’s director level and above who are currently practicing real-time marketing drives home the idea that effective real-time marketing cannot consist of a string of sporadic actions, but instead requires a carefully planned strategy with the resources to discover the right audiences and target them with the right content at the right time. Learn what the leaders in real-time marketing are doing well, how they’re doing it, the results they’re seeing- and the one thing that all of them could be doing better.